The North American X-15 rocket-powered aircraft/spaceplane was part of the X-series of experimental aircraft, initiated with the Bell X-1, that were made for the USAF, NASA, and the USN. The X-15 set speed and altitude records in the early 1960s, reaching the edge of outer space and returning with valuable data used in aircraft and spacecraft design. 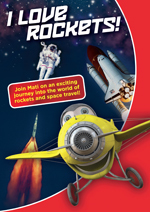 It currently holds the official world record for the fastest speed ever reached by a manned rocket powered aircraft. During the X-15 program, 13 of the flights (by eight pilots) met the USAF spaceflight criteria by exceeding the altitude of 50miles (80.47km, 264,000ft), thus qualifying the pilots for astronaut status. The USAF pilots qualified for USAF astronaut wings, while the civilian pilots were later awarded NASA astronaut wings. Of all the X-15 missions, two flights (by the same pilot) qualified as space flights per the international (F�d�ration A�ronautique Internationale) definition of a spaceflight by exceeding a 100kilometer (62.137mi, 328,084ft) altitude. 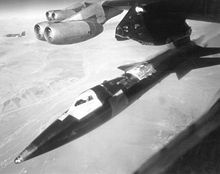 Picture - X-15 just after release. The X-15 was based on a concept study from Walter Dornberger for the NACA for a hypersonic research aircraft. The requests for proposal were published on 30 December 1954 for the airframe and on 4 February 1955 for the rocket engine. The X-15 was built by two manufacturers: North American Aviation was contracted for the airframe in November 1955, and Reaction Motors was contracted for building the engines in 1956. Like most X-series aircraft, the X-15 was designed to be carried aloft, under the wing of a B-52 bomber plane. The X-15 fuselage was long and cylindrical, with rear fairings that flattened its appearance, and thick, dorsal and ventral wedge-fin stabilizers. Parts of the fuselage were heat-resistant nickel alloy (Inconel-X 750). The retractable landing gear comprised a nose-wheel carriage and two rear skis. The skis did not extend beyond the ventral fin, which required the pilot to jettison the lower fin (fitted with a parachute) just before landing. The two XLR-11 rocket engines for the initial X-15A model delivered 16,000lbf (71 kN) maximum thrust each, for a total of 32,000 pounds-force. The main engine (installed later) was a single XLR-99 rocket engine delivering 57,000lbf (250 kN) at sea level, and 70,000lbf (310 kN) at peak altitude. The idle thrust of the XLR-99 was 15,000lbf (67 kN). Picture - X-15 touching down on its skids. Compare jettisoned lower ventral fin with color picture, top. Early flights used two Reaction Motors XLR11 engines. Later flights were undertaken with a single Reaction Motors Inc XLR99 rocket engine generating 57,000pounds-force (250 kN) of thrust powered the aircraft. This engine used ammonia and liquid oxygen for propellant and hydrogen peroxide to drive the high-speed turbopump that delivered fuel to the engine. The XLR99 could be throttled, and were the first such controllable engines that were "man-rated", that is, declared safe to operate with a human aboard. Three X-15s were built, flying 199 test flights, the last on 24 October 1968. 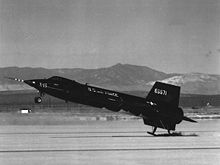 The first X-15 flight was an unpowered test flight by Scott Crossfield, on 8 June 1959; he also piloted the first powered flight, on 17 September 1959, with his first XLR-99 flight on 15 November 1960. Twelve test pilots flew the X-15; among them were Neil Armstrong (first man to walk on the moon) and Joe Engle (a space shuttle commander). In July and August 1963, pilot Joe Walker crossed the 100km altitude mark, joining the NASA astronauts and Soviet Cosmonauts as the only humans to have crossed the barrier into outer space (Soviet Yuri Gagarin was the first person in space, reaching 327km in apogee of his orbital flight, while Alan Shepard was the first American in space, reaching 187km during suborbital flight) and becoming the first to exceed this threshold twice. U.S. Air Force test pilot Major Michael J. Adams was killed on 15 November 1967 in X-15 Flight 191 when his craft (X-15-3) entered a hypersonic spin while descending, then oscillated violently as aerodynamic forces increased after re-entry. As his craft's flight control system operated the control surfaces to their limits, the craft's acceleration built to 15g vertical and 8g lateral. The airframe broke apart at 60,000ft (18,000 m) altitude, scattering the craft's wreckage for 50square miles (130 km). On 8 June 2004, a monument was erected at the cockpit's locale, near Randsburg, California. Major Adams was posthumously awarded Air Force astronaut wings for his final flight in craft X-15-3, which had reached 266,000ft (81.1km, 50.4mi.) of altitude. In 1991, his name was added to the Astronaut Memorial. Picture - Bomber NB-52A (s/n 52-003), permanent test variant, carrying an X-15, with mission markings; horizontal X-15 craft silhouettes denote glide flights, diagonal silhouettes denote powered flights. The second X-15A was rebuilt after a landing accident. It was lengthened 2.4feet (0.73 m), a pair of auxiliary fuel tanks attached under the fuselage, and a heat-resistant surface treatment applied. 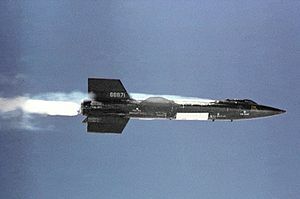 Re-named the X-15A-2, it first flew on 28 June 1964, reaching 7,274km/h (4,520mph, 2,021m/s). The altitudes attained by the X-15 aircraft do not match that of Alan Shepard's 1961 NASA space capsule flight nor subsequent NASA space capsules and space shuttle flights. However, the X-15 flights did reign supreme among rocket-powered aircraft until the second spaceflight of Space Ship One in 2004. A 200th flight over Nevada was slated for 21 November 1968, piloted by William J. Knight. Technical problems and bad weather delayed the flight six times, and on 20 December 1968, the 200th flight was finally cancelled. The X-15 was unfastened from the wing of bomber NB-52A, and prepared for indefinite storage. X-15-1 (s/n 56-6670) is on display in the National Air and Space Museum "Milestones of Flight" gallery, Washington, D.C.
X-15-2A (s/n 56-6671) is at the National Museum of the United States Air Force, at Wright-Patterson Air Force Base, near Dayton, Ohio. It was retired to the Museum in October 1969. The aircraft is displayed in the Museum's Research & Development Hangar alongside other "X-planes", including the Bell X-1 and X-3 Stiletto. X-15-3 (s/n 56-6672) was destroyed. Parts have been recovered at the crash site as late as the 1990s. Evergreen Aviation Museum, McMinnville, Oregon (painted with s/n 56-6671). This is the only known full-scale wooden mock-up of the X-15, and it is displayed along with one of the rocket motors. NB-52A (s/n 52-003) is at the Pima Air and Space Museum, Tucson, Arizona - launched the X-15 #1 thirty times, the X-15#2 eleven times, and the X-15#3 thirty-one times (as well as the M2-F2 four times, the HL-10 eleven times and the X-24A twice). NB-52B (s/n 52-008) is at the Dryden Flight Research Center, Edwards AFB, California, USA - Launched the majority of X-15 flights. Before 1958, USAF and NACA, (later NASA), officials discussed an orbital X-15 spacecraft - the X-15B - for launching to outer space atop an SM-64 Navajo missile. This was canceled when NACA became NASA, and Project Mercury was approved instead. By 1959, the X-20 Dyna-Soar space-glider program became the USAF's preferred means for launching military manned spacecraft into orbit; however, this program was canceled in the early 1960s before an operational vehicle could be built. There are two definitions of how high a person must go to be referred to as an astronaut. The USAF decided to award astronaut wings to anyone who achieved an altitude of 50miles (80.47km) or more. However the FAI set the limit of space at 100km. Thirteen X-15 flights went higher than 50miles (80.47km) and two of these reached over 62.137miles (100km). 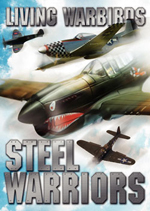 Hallion, Dr. Richard P. "Saga of the Rocket Ships." AirEnthusiast Six March-June 1978. Bromley, Kent, UK: Pilot Press Ltd., 1978. Kx�smann, Ferdinand C.W. 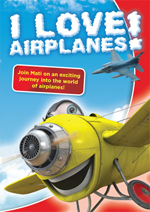 "Die schnellsten Jets der Welt". Weltrekord-Flugzeuge [World Speed Record Aircraft] (in German). Kolpingring, Germany: Aviatic Verlag, 1999. 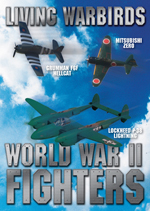 ISBN 3-925505-26-1.